When the definitive history of the personal computer is written, familiar and historic names such as Olivetti, Apple, IBM, will all be given recognition for their innovations of the 1960s and 1970s. But will future generations remember visionary John Blankenbaker, and his ground-breaking invention, the Kenbak-1 Digital Computer? It was a machine that first went on sale in 1971 and is considered to have been the world's first "commercially available personal computer", coming on to the market some five years before Apple 1. In fact it was a panel of experts, including Apple co-founder Steve Wozniak, meeting at the Boston Computer Museum in 1987, which gave the Kenbak-1 its pre-eminent status. Back in 1970 Mr Blankenbaker, then a computer engineer and consultant, put together his machine at his home in Brentwood, California. "I came into a little money and decided it was time to build a small computer that could be afforded by everyone," he tells me. "It did not use any microprocessors, and I did the work in my garage." In the early days of the office computer even a small device cost thousands of dollars, whereas Mr Blankenbaker's aim was a simple computer that would cost no more than $500 (then roughly £200). Unlike most hobby computers of the time, it was sold as an assembled and functioning machine rather than as a kit. His ambition was that the device should be educational, give user satisfaction with simple programmes, and demonstrate as many programming concepts as possible. "I thought of the Kenbak as an affordable introduction to the study of computer programming - I emphasized the hands on experience," he recalls. He demonstrated his prototype computer at a high school teacher's convention in southern California, and when the computer went into production, its advertising was focussed on the schools market, something he now feels was a mistake. "It should have been at the hobby-oriented people," he says. "Schools took too long for budget approval. "My failure was in marketing, but the machine was a success in its limited way." As it happens, the costs involved meant the computer had to be sold for $750 (about $4,400 in 2015) . Ironically it's a price that would be considered an investment nowadays, when one considers that a prototype Kenbak-1 sold for $31,000 at Bonhams in New York last month. Now one of the few remaining existing production models is expected to sell for between 20,000 ($22,000; £14,400) and 40,000 euros when it goes up for auction in Germany on Saturday, 7 November. By the time Kenbak Corporation closed in 1973 it had completed one production run of just 50 computers, and is now virtually unknown today. Mr Blankenbaker says that as well as US sales, there were also buyers from France, Spain, Italy, Mexico, and Canada. 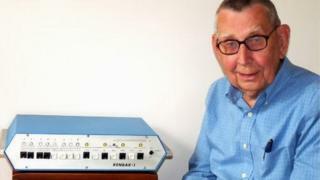 Mr Blankenbaker, now 85, and retired to Chadds Ford, Pennsylvania, first became interested in computers when he was a first year physics student in the 1940s. "When I was a freshman at Oregon State College in 1949, I read about Eniac (Electronic Numerical Integrator And Computer)," he says. "This inspired me to design a computing device. It was a kludge but it inspired an interest in computers." Two years later he was an intern at the National Bureau of Standards where he was assigned to the Seac (Standards Eastern Automatic Computer) where he learned how a modern computer worked. "Seac was very large; it had its own building," he recalls. "In 1952 on graduation I worked for Hughes Aircraft Company in a department which was building a suitcase-sized computer for airborne work." By 1958 he had described the future principles of the Kenbak-1 machine in an article entitled "Logically Microprogrammed Computers". The Kenbak-1 was designed before microprocessors were available - the logic consisted of small and medium scale integrated circuits mounted on one printed circuit board. MOS shift registers implemented the serial memory. "[It] lacked sophisticated input-output, a large memory, and interrupts," says Mr Blankenbaker. "Otherwise it demonstrated stored programs with three registers, five addressing modes, and a rather complete instruction set which only lacked multiplication and division." "The computer was intended to be educational," he adds. "Professionals in the field were enthusiastic but it was a struggle to convince the non-professionals that they could buy a real computer at this price." The Kenbak-1's advertising in 1971 stated: "Fun Educational Modern Electronic Technology created the Kenbak-I with a price that even private individuals and small schools can afford. "Step-by-step you can learn to use the computer with its three programming registers, five addressing modes, and 256 bytes of memory. Very quickly you, or your family or students, can write programs for fun and interest." However, as Mr Blankenbaker says, he may have been more successful targeting his sales at the university students and young professionals who would go on to provide Apple's customer base later in the decade, and indeed still do. After the Kenbak-1 experience he worked at International Communication Sciences, at Symbolics, and at Quotron, before retiring in 1985. He says he did not make much money out of the Kenbak-1 venture, and that one of his failings was in underestimating the development of high technology. "In 1970, I had no vision of what the future would bring. I always felt that the current technical situation was the most that could be expected."